Encyclopedia of Judaism, Second Edition explores a religion that has a 2,000-year recorded history and has been a part of the culture of almost every country and society around the globe. 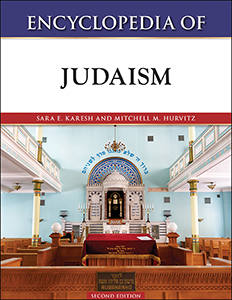 Encapsulating all things Jewish—language, laws, literature, arts, theology, ritual, land, culture, and personalities—this authoritative volume offers readers access to Judaism from both a historical and contemporary perspective. Since the demise of the Israelite religion, Jewish people have settled around the world, adapted to their host cultures, and produced cultural variances within Judaism. In doing so, they have experienced prosperity and tragedy, all of which is reflected in this comprehensive reference, along with biographical data on notable Jewish individuals. Hundreds of A-to-Z entries cover Jewish tradition from religious practices in the Temple through exile and diaspora in Europe and Asia, to the expansion of Jewish denominations in America to the modern state of Israel and the continual development of rich diaspora Jewish communities. A bibliography, a chronology, and photographs complete this valuable resource. This eBook is an easy-to-use and essential reference for high school and college students, researchers, and general readers. Sara E. Karesh, Ph.D., is a teacher of Jewish history and comparative religion at the Charles E. Smith Jewish Day School in Rockville, Maryland. She received her M.A. in Jewish studies from the Jewish Theological Seminary of America and her Ph.D. in religious studies from the University of California, Santa Barbara. Mitchell M. Hurvitz is senior rabbi at Temple Sholom in Greenwich, Connecticut, and a columnist for the Greenwich Time and the Connecticut religion blog Creedable. He received his M.A. and ordination from the Jewish Theological Seminary of America. He is a past president of the Greenwich Fellowship of Clergy and the co-founder of the Sholom Center for Interfaith Learning and Fellowship.